I just received Vermont Historical Society’s History Connections, vol 12, number 1, and inside this short newsletter features an article on the two of the earliest known photographs of Vermont, taken in 1845 by Thomas Easterly (1809-1882) of Guilford, Vt. According to the article, Easterly was an itinerant calligrapher and teacher of writing. He learned the art of photography in Albany, Ny. or New York City, and by 1844 was on a steamer to New Orleans. 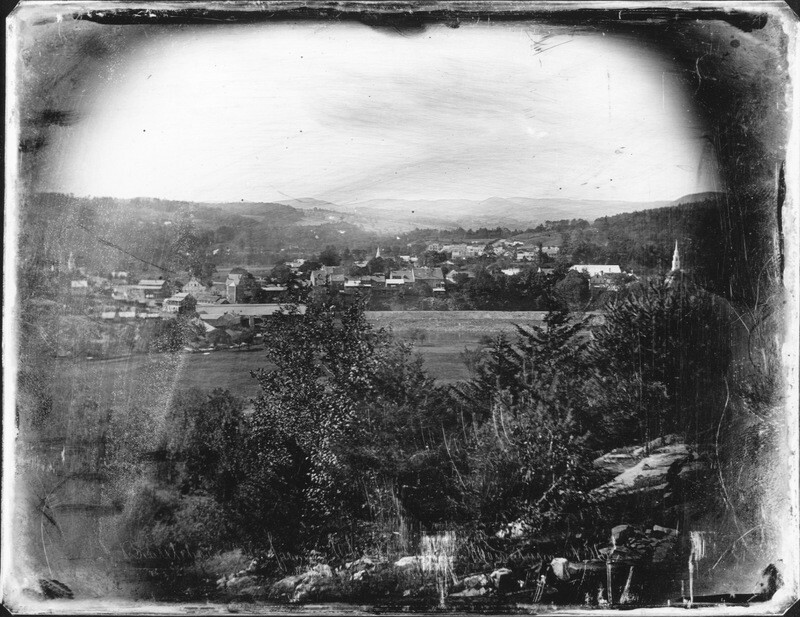 When he returned to Vermont in 1845, he began to take photos of the landscape around Burlington, Rutland, and Brattleboro. This 1845 daguerreotype was taken from the base of Mt. Wantastiquet looking toward Brattleboro. Brattleboro, Vt., from Chesterfield Mountain, N.H.; courtesy of Digital Vermont, Easterly, Thomas M. (Thomas Martin), 1809-1882, “Brattleboro, Vt., from Chesterfield Mountain, N.H.,” Digital Vermont: A Project of the Vermont Historical Society, accessed December 21, 2017, http://digitalvermont.org/items/show/1100. Eight of Easterly’s photos may be viewed at the Vermont Historical Society’s Digital Vermont website. “Missouri, Death Records, 1834-1910,” database and digital images, Ancestry (http://www.ancestry.com : viewed 21 December 2017), entry for Thomas Easterly, Burial Certificate 1487, St. Louis, Mo; citing Missouri Death Records. Jefferson City, Mo., Missouri State Archives Microfilm. I have never seen this, Jerry. Amazing! Yes, Rich, thanks for the comment. I would like to see the this 173 year old daguerreotype up close! It is interesting that Easterly got his start in calligraphy and then went on to become proficient in photography. I wonder if any of his calligraphic art is extant?